While our large residents have the west wing of the building to themselves, our smaller canine friends occupy the entire east side. Between our Small Dog Village and Pool Room Suites, we can provide roughly 20 individual spaces for little pups to call their own during their stay. Unless specifically requested, all dogs residing in this area of Heartstrings do not interact with our larger dogs for both safety reasons and the fact that most smaller canines can be quite timid around their bigger counterparts. Heartstrings can provide bedding (blankets, sheets, rugs, plush beds), but feel free to bring in your dog's bed from home if it makes him/her feel more comfortable. We can also provide pre-shredded bedding for those who tend to destroy theirs during their visit, and we may replace your personal bedding with ours if we notice destructive behaviors to save their own. This is our Small Dog Village. While we prefer to keep our entire facility completely off leash, we also understand that many small dogs enjoy private time in a crate and may rest better or feel more secure in a somewhat-familiar surrounding. This is the ONLY area in our entire building that has crates (unless owners provide their own for their dog to have in their room). 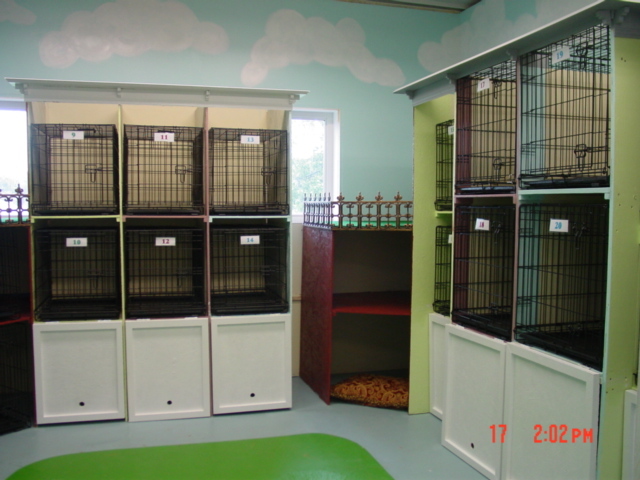 Guests staying in this area spend the majority of their day on the floor with their buddies for a day full of playtime, only returning to their crate during feedings and overnight. Because of this extended time around others, we tend to only board residents here that are extremely social and would rather have the company of other dogs than be alone. Clients only sleep in the middle row of crates - those on the top shelf are specifically used to house an individual's belongings such as food, treats, and medication. Not pictured to the left is a mirror image of the crate system on the right, meaning that there are a total of 7-8 spaces available at any given time. We can also bed one to two dogs on the floor, which gives them ample space to stretch out and relax in the company of others (usually there will only be one; if there are two, they must be very familiar with each other or from the same family). This area is also host to our small dog daycampers during the week. In the past, Heartstrings used to have a pool that clients could swim in with staff to play and relieve stress. Now, the pool has been filled in, and in its place are 12 individual 4X6 foot suites for boarding our small dog friends. The Pool Room suites are designed to replicate our large dog structure: individual rooms for dogs who need alone-time or prefer to rest away from a larger group. However, even though the rooms are separate, they can still hear other boarders next to them, so they never feel completely alone. Depending on the sizes, up to three small dogs from the same family can fit comfortably in these suites, a 20% discount being provided to any additional dog after the first in these cases.